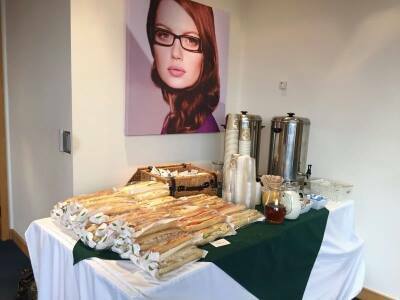 Last year we took on a new venture for Saffron Catering when we won a tender to provide the catering at a Deli Canteen at the Head Office of a well known eye care supplier in Nottingham. This was something we had never done before but we love a challenge! 6 months on, we work closely with the Facilities Team at the Head Office and have built up a fantastic relationship with them. For the 4th month running, our catering, service and management has seen us achieve a 100% score on our monthly review which is absolutely fantastic. Over the past couple of weeks, we have been providing a catering service for a training forum the team were holding, which was held over an 8 day period. Our team were on site, set up and ready to serve corporate hospitality from 0700 every morning, offering tea and coffee to the guests throughout the day, followed by a delicious cold lunch, further refreshments in the afternoon before finishing at 1700. For ease of the guests who had very busy days, we suggested ‘grab bags’ in which we varied the contents on a daily basis, offering salads, sandwiches, baguettes etc. The guests were suitably fed and watered throughout the day and we worked well as a team to ensure they well looked after! 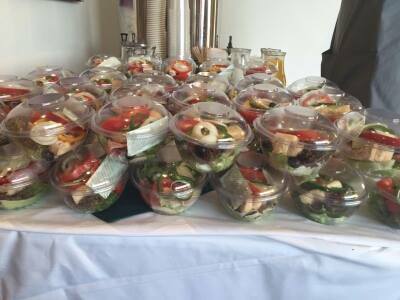 By working closely with the Facilities Team and guiding them on the best way forward in respect of corporate catering, the event was a great success and the Team have booked in two blocks of further dates for future events.